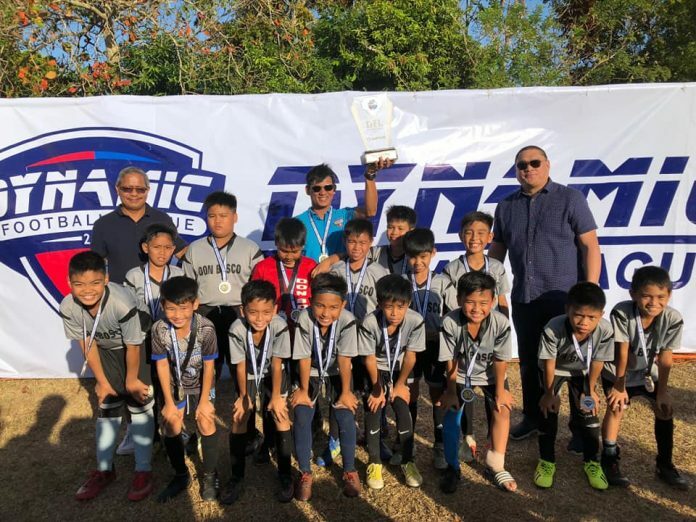 MANILA – Don Bosco Technical Institute, Canlaon Hijas, University of Negros Occidental-Recoletos, and Pontevedra bagged a championship each in the Dynamic Football League 2019 1st Conference at the Sta. Maria Football Field in Negros Occidental. Don Bosco claimed the championship in the born 2008 boys category after beating UNO-R in the finals. Pontevedra claimed the second runner-up finish. France Pagador of Don Bosco was hailed as MVP while teammates Joshua Padiila and Andrie Salud were best defender and best goalkeeper, respectively. John Canoy of UNO-R was best midfielder while Wes Benedict Escanlar of Pontevedra was best striker after tallying 21 goals in the competition. Canlaon Hijas, on the other hand, bagged the title in the born 2004 girls category by beating Pontevedra in the finals. Silay squad took the second runner-up finish. Canlaon Hijas dominated the individual awards with Chenny Dañoso hailed as MVP and best striker, while Jennyfer Milla was best goal keeper and Kryshna Kae Sia was best defender. Hanna Montalban of Pontevedra was best midifielder. UNO-R, meanwhile, ruled the born 2010 mixed category with Pontevedra and Don Bosco settling for first and second runner-up finishes, respectively. Martin Villanueva of UNO-R was named as the MVP while teammates Johan Estomata (best goal keeper), Rhybel Pateño (best midfielder) and Chris Eduard Tolimao (best defender) also took home individual awards. John Rendon of Pontevedra was the best striker. Pontevedra-A was named as the champions in the born 2012 mixed category, while University of St. La Salle and Negros Elite FA taking the silver and bronze medal finishes.